I currently maintain an unlucky system with respect to HDMI audio: nVidia PCIe video card(w sound chip),an Intel sound chip on the motherboard, and HDMI outputs from both the motherboard and the nVidia board. I attempted to install Arch, and Arch with Nouveau drivers (minus proprietary nVidia modules), and without PulseAudio. Nouveau audio was a no-go, so that I had to revert to proprietary nVidia drivers. Avoiding PulseAudio was successful -- the steps for that begin below. The steps are entirely accomplished inside Runlevel 2/3 or a terminal, but I included one optional Xorg step at the bottom of the post. HDMI sound requires at least four reconciled systems -- Xorg, ALSA, kernel modules and, of course EDID -- and some of these have subfiles. That's too many variables for consistently easy sound configuration, and sound is already one of the more challenging aspects of Linux. One bit of Arch-specific luck is ALSA modules are nowadays compiled into the Arch kernel. "Static", because compiled into the kernel. If not present, fundamental ALSA must be installed and the dynamic loading of its modules verified. after the above, pacman all additional ALSA stuff in the repo, avoiding ALSA-PulseAudio libs (and other applications which automatically install PulseAudio) and, if feasible, also avoiding ALSA-OSS libs. Generally, the less non-ALSA audio libs the better. verify (in an already-working system) one has a good HDMI cable and then connect it between the the nVidia card and one's desired monitor/TV. Once we connect to nVidia video, we're obviously committed to nVidia's sound chip (since HDMI cable carries both audio and video). $ lsmod |grep soundcore :: soundcore must be present. ...and do conflict tests. In my case, I made note of the DEV=0 overlap, but pressed on. So far: No sound yet, since default audio is going to PCH, not to nVidia. However there is progress: we know ALSA assigned unique names for the two audio chips -- "PCH" and "NVidia". We know both audio chips rely on module snd_hda_intel, that the PCH chip is loading as the default, that the nVidia chip has four available devices (0,1,2,3), and that a good HDMI cable has been connected between the nVidia HDMI port and my monitor. How to control the load order (default)? /etc/modprobe.d/(somename).conf :: kernel manipulation, as just noted above. /etc/asound.conf in Arch, the file does not exist by default, but can be created by apps (like PulseAudio) or by the user. ~/asound.rc home directory version of asound/conf, if one does not desire global settings. /usr/share/alsa/alsa.conf a default file, installed with ALSA. To narrow troubleshooting variables, I do any ALSA customization only in this default /usr/share/alsa/alsa.conf file. The first modification is to prevent the other two files above from being sourced. Some users simply delete /etc/asound.conf and ~/.asoundrc entirely or rename them to backup files. We need ELD information before we can modify this file entirely however. ELD information is critical to complete HDMI modifications inside /usr/share/alsa/alsa.conf. Be sure the HDMI cable is connected to the NVidia HDMI output and to the monitor to which you're connecting. Here, only nVidia audio card (chip) 1 is validated for HDMI audio. However, these "card" numbers 0,1,2,3, are not the actual hardware numbers. We need hardware numbers for ALSA. So, for HDMI 1, the ELD validated sound card/chip with my monitor, the hardware number will be hw:1,7. Now I can return to /usr/share/alsa/alsa.conf and make the necessary HDMI modifications. This means I've swapped the cards' default order from "0" to "1", and specified the ELD-authorized device by its hardware number, "7". $ alsamixer :: unmute "S/PDIF 1" on the NVidia card. F6 switches between cards. Should hear "Center" from TV's speakers. Aplay won't do MP3's to my knowledge -- use this ALSA player with a WAV. enjoy. I must manually unmute S/PDIF 1 each reboot, or modify some other file, but that's another day/process. Following any system update that changes ALSA, (eg, following pacman -Syu) sound may be lost. First, open alsamixer to verify it wasn't re-muted. Secondly, the update may have overwritten /usr/share/alsa/alsa.conf. Re-enter the modifications (scroll down) and device settings in alsa.conf, resave, and log out and back in, or reboot. 1.) deleting ~.config/vlc as a fix. 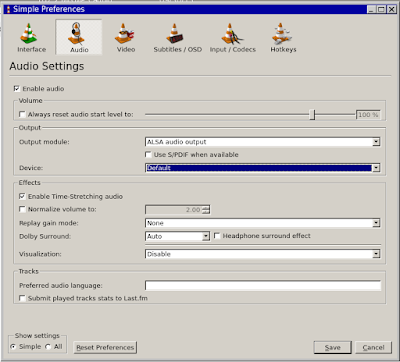 When sound comes OK from ALSA ($ aplay -D plughw:1,7 /usr/share/sounds/alsa/Front_Center.wav, as above), but VLC is soundless, try deleting~/.config/vlc, and let VLC respawn the file. ... yet MP3's play fine with other players. 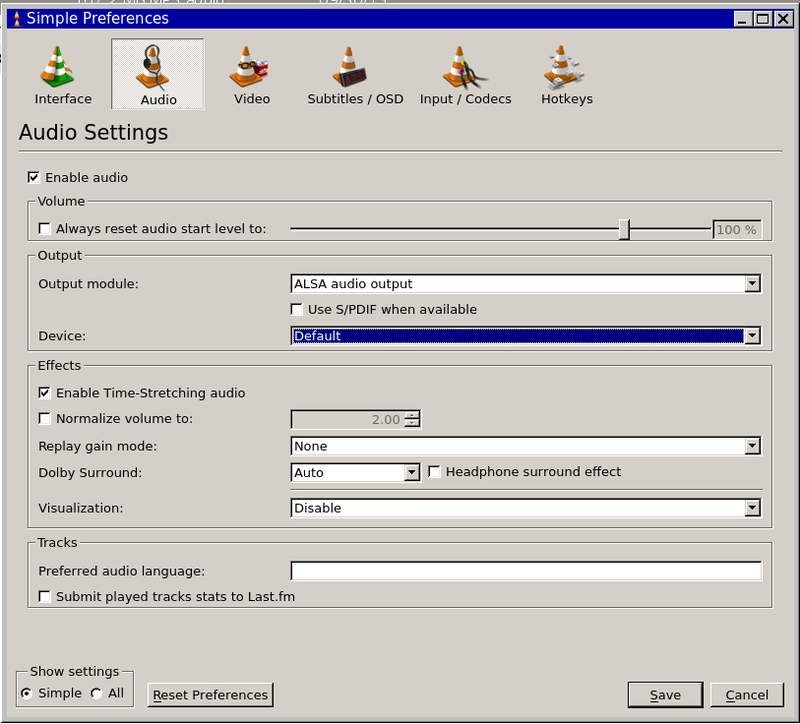 Without PulseAudio, they are getting their input from ALSA, so we know it's not ALSA, it's VLC. The fix for me has been the SPDIF function, which sends audio directly to the device, without decoding, which it can't always handle. Make sure it's unchecked as seen below. Incidentally, beneath the quality of lossless (flac and wav), apparently the compression quality proceeds: Opus better than AAC, with AAC better than MP3. One of the sound cards is an nVidia graphics card. $ nvidia-xconfig --no-use-edid-dpi $ nano /etc/X11/xorg.conf Option "DPI" "100 x 100"
Note that, in this second example, the underscores in the module name are changed to hyphens. If you have some old 32-bit Windows programs and want to run Wine, what are the concerns? You'll first have to uncomment the two multilib lines in /etc/pacman.conf to access it. Wine itself is then about a 600MB kludge install due to all the attached 32-bit libs. Most importantly here, one of the 32 bit choices affects the nVidia card. During Wine install, users must select either the lib32-mesa-libgl or lib32-nvidia-gl. I have th nVidia card in my system, so it seems like the safe choice. What about compatibility though? So many things use Mesa.